Samsung has admitted it made a mistake in releasing a software update that removed a search function from international versions of its flagship smartphone. The "stability update" disabled the Galaxy S3's ability to search the web, contacts, apps and other on-device material through a single interface. The move had been thought to be linked to Apple's claim that the innovation infringed one of its US patents. 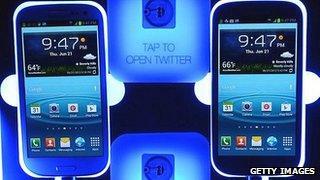 Samsung said a fix was imminent. "The most recent software upgrade for the Galaxy S3 in the UK included the inadvertent removal of the universal search function," it said in a statement. "Samsung will provide the correct software upgrade within the next few days." Users who downloaded the update had not been warned that it would remove the advanced search function when the software was installed on GT-i9300 (S3) models available in the UK and other places outside the US. It appears the firm meant only to prevent some US models from being able to use a Google-powered search tool to show information sourced from within the phone's memory in its results. Apple has claimed the technology infringed its patent to a unified search interface which it uses in its Siri app to collate results from a range of sources. The iPhone maker has launched a lawsuit over the matter in the US and had briefly secured a sales ban of another Samsung handset - the Galaxy Nexus - on the basis that the inclusion of the feature threatened "irreparable harm". A Washington-based court will review the case on 20 August.